The first contest presented by The Undead Bazaar has come to an end. 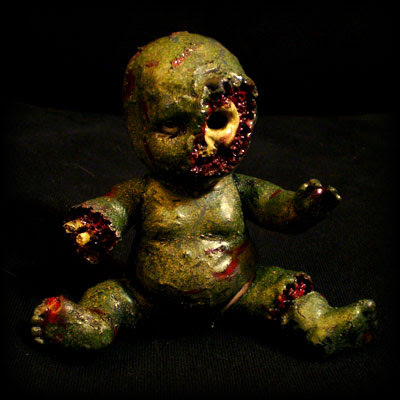 The grand prize winner will be receiving a zombie doll from Abomination Nursery. Several runners-up will receive some other great items also provided by Abomination Nursery. Congratulations to the winners and don't forget to enter all of the other great contests being presented by The Undead Bazaar! Yeah, runner up is better than no runner at all! Can't wait to get my swag! I just received this today. Was really impressed by the quality of the items (which were sent as photographs). Though I was glad that it wasn't inspected by USPS. Lots of dead babies in that envelope, lol. The baby arm keychain is a keeper. Awesome toy. Thanks for hosting so many awesome contests here!